One way doors are a great way to get squirrels or other wildlife out of a home or building. Please be aware that this technique won't necessarily solve your squirrel problem - new squirrels will quickly move in to replace the old ones. If there's squirrels in the attic, there is probably a nest of baby squirrels up there. If squirrels are chewing, excluding them won't stop new ones from doing the same. The situation is often more complex than simply setting one-way doors. And to be honest, this technique is not necessarily easy for beginners. Click here for my nationwide list of 100's of professional squirrel trappers serving all 50 states. One-way doors are mounted directly on a building, right over a hole squirrels are using to enter and exit a house. The device should have flanges, or wings on one end, to mount the trap to the building, and a torsion-spring repeating one-way door leading into the cage. This type of setup is the best way to remove the target squirrels, instead of traps, which can catch non-target, or incidental animals. Here are some photos of various one-way door setups. First, find the hole that the squirrels are using to get into and out of the house. If there are several holes, seal up all but one hole, preferably the most popular one. All seal-ups should be done with steel screening, the kind that squirrels can't chew through. And remember, squirrels are great chewers! The one-way door is a great option for simply getting all of the squirrels out of a house, and not letting them back in. 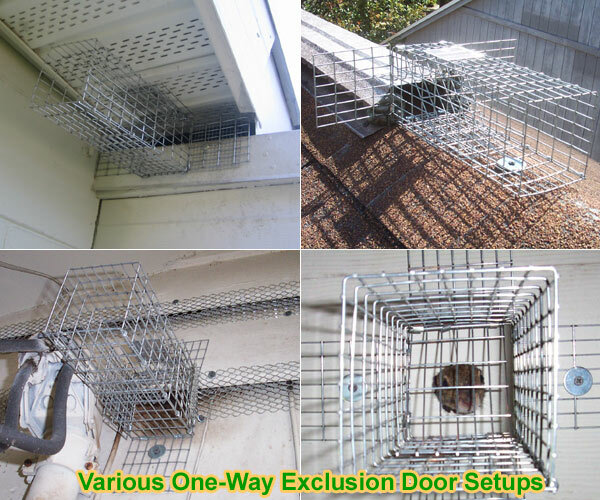 Don't use this trap if there are areas that squirrels can use to chew their way back in - only use it on secure homes with well-defined entry/exit holes like the ones pictured above. You can also use a funnel. I've made the one you see above. The squirrel in this photo is actually in the midst of slipping out of this thing like butter. It seriously just slinked out in like a tenth af a second at lightning speed. I had one chance at a photograph, and wish I'd caught it a nanosecond later, with most of the body out. Funnels like these must be extremely precise to let the animals get out, but not get back in. Too big a hole, and they can re-enter. Too small, and they won't be able to get out. Click here for my full guide on how to get squirrels out of the attic for advanced tips and advice, or my original squirrel removal page with various basic information.